Pyramidal shape as it matures - a nice formal planting. 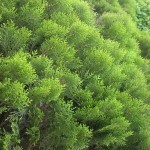 Has bluish green foliage whose tips turn a plum purple in the winter months. It is a great selection for many landscapes. Loves full sun, but will accept partial shade as well. Handles a wide variety of soil conditions, but prefers any soil that drains well. 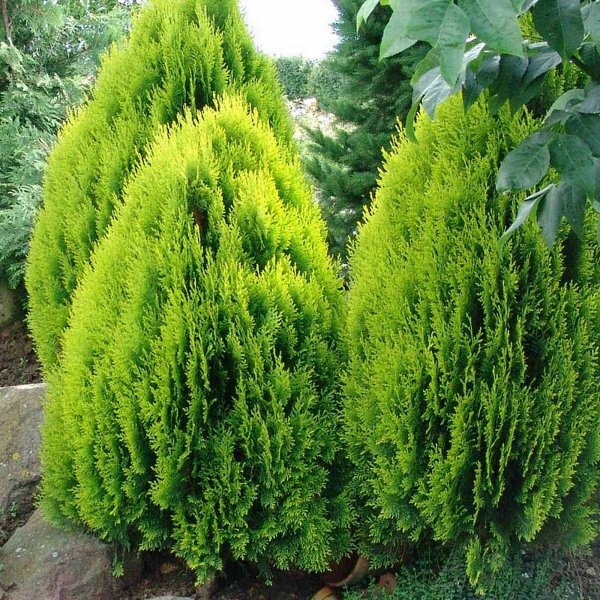 It is a small, slow-growing tree, to 1,5-2 m tall and 0.5 m trunk diameter. The foliage forms in flat sprays with scale-like leaves 2-4 mm long. The cones are 15-25 mm long, green ripening brown in about 8 months from pollination, and have 6-12 thick scales arranged in opposite pairs. It is very widely used as an ornamental tree, both in its homeland, where it is associated with long life and vitality, and very widely elsewhere in temperate climates. The wood is used in Buddhist temples, both for construction work, and chipped, for incense burning. Germination 1. Pour 1/4 cup of vermiculite or sand into a plastic sandwich bag. Add 3 tablespoons of water. Set the bag aside for 30 minutes to allow the vermiculite or sand to soak up the water. 2. Drain excess water from the bag. 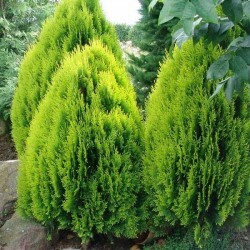 Place arborvitae seeds in the planting medium or moist vermiculite. Seal the bag, and place it in the refrigerator for 60 days. 3. Pour moist seed-starting soil into a nursery flat. Insert craft sticks into each corner of the flat. 4. Sprinkle the contents of the plastic bag over the surface of the planting medium in the flat. Cover this layer with a 1/8-inch layer of sand or vermiculite. Place the flat into a plastic bag, and adjust it so that the sticks hold the plastic away from the planting medium. Set the flat in an area sheltered from direct sun. Keep the temperature between 65 and 75 degrees Fahrenheit. The arborvitae seeds will germinate in 14 to 40 days.